Shakib Al Hasan put on an all-round performance to lead Bangladesh to a convincing 36-run victory over West Indies in Dhaka and level the three-match T20I series 1-1. 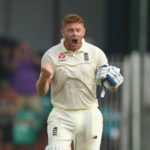 Jonny Bairstow’s 110 for England against Sri Lanka, and Nayeem Hasan’s 5-61 on debut for Bangladesh against West Indies were the highlights of Friday’s Test cricket action. 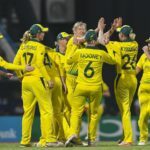 Australia made their fifth consecutive ICC Women’s World T20 final with a 71-run win against the hosts and defending champions the Windies on Thursday. 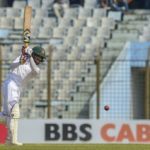 A superb 120 from Mominul Haque was the backbone of Bangladesh’s first-day effort of 315-8 in the first Test against the West Indies at Chittagong. India scrambled a single off the final ball of the third T20I against the West Indies to clinch victory and with it a 3-0 series victory at Chennai. Deandra Dottin took a sensational 5-5 for the West Indies as they crushed Bangladesh by 60 runs in their opening Women’s World T20 match, despite posting a light target for the Bangladesh Women’s team to chase in Providence. 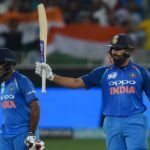 An imperious, undefeated 111 by Indian skipper Rohit Sharma set the platform for an easy win for India in the second T20I against the West Indies at Lucknow. India won the first T20I in the series against the West Indies by five wickets at Kolkata. 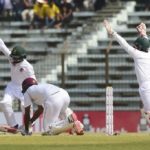 West Indies fielding coach Nic Pothas has highlighted the importance of staying focused through an entire ODI match if players hope to beat the best in the world. India pulled 2-1 up in the ODI series against the West Indies after a thumping 224-run win in Mumbai. The West Indies followed up their phenomenal tie with India by claiming a 43-run win in the third ODI to level the five-match series 1-1. A strong team performance from Zimbabwe was not enough to earn the southern Africans a victory against a highly professional Bangladesh outfit who continue to impress on the international stage. Shai Hope slammed the last ball of the match for four to earn the West Indies a dramatic tie against India, both teams scoring 300-plus for the second ODI in a row.